Oooo how gorgeous are these 2 bags??? I love them! 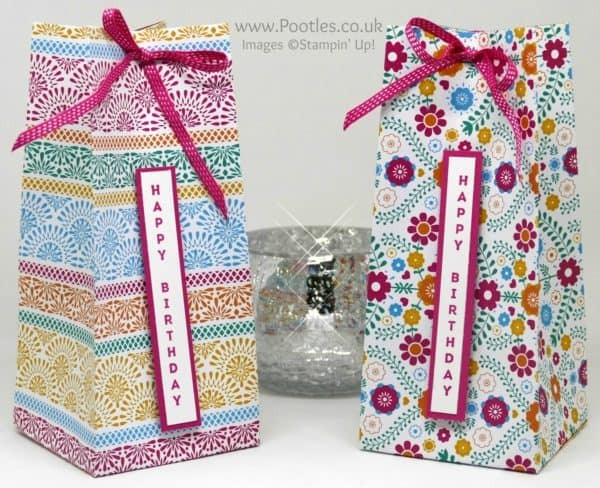 I love the paper, I love the finish, I love the stamping! They’re just so very me!!! Can you imagine gifting one of these bags to someone with maybe a small bottle of fragrance in it? Or maybe filled with their favourite chocolates??? It’s the kind of bag that would be left until last because it’s so pretty and you just know that love and care has gone into it! And as ever, while love and care has gone into it, it’s a quick make. I think by now you all know that I’m a speedy crafter….! It finishes at 2-5/8 x 2-5/8 x 6″ (6.5 x 6.5 x 15cm) and is good for lots of pretties! I hope you enjoy the video and you’re having a good Wednesday! Love the bright papers, for sure a happy gift! tfs! These papers are perfect for giving a festive look!! Love this bag! And, yes I was cheering you on when you made the bow. I am definitely bow challenged. Keep it up. And I hope you don’t mind me mentioning that I am very happy to see your rings on your left hand again. I hope and pray that everything is going good! Lovely, cherry bags to brighten the day.